Should I Keep My 351M/400 or Should I Swap in a 429/460? So...... It's time to replace that worn-out, venerable old oil-burning "M" Block in your Bronco. You may be asking your self, "Should I keep it, or chunk it? This is the very same question I was faced with when my original 196,000 mile 351M puked it's timing chain this past April. I even considered replacing the timing chain and seeing if I could keep the old beast running for "just a few more years" before I had to under take a massive engine replacement project. However, as it stood, I couldn't keep oil in the engine because every seal that could be leaking was leaking. I had no oil pressure left. The truck left a trail of oil smoke where ever I went, and the engine was really low on horse power. So making the decision to rebuild or replace the original engine was a no brainer. However, the question still remained; should I rebuild it, should I replace it with another "M" block, or should I go all-out and swap in a 429/460? The 429/460 swap into these Broncos is a well documented procedure with many parts available strictly for this vehicle/engine combination. A 429/460 can be installed in a 78-79 Bronco using all factory parts. (See the related articles below). There is no need to buy expensive engine swap kits if you can find the right parts. The Bronco's cooling system can easily be upgraded to keep a 429/460 running nice and cool. A 429 can easily be enlarged to 460 CID by simply replacing the 429 crankshaft and pistons with those from a 460. A stock 4V 429/460 will give a Bronco significant power and performance increases over a stock 351M and even a little more power and performance over a stock 400. There is no need to buy aftermarket manifolds, cam shafts, and carburetors to gain additional performance from you Bronco with a 429/460 -- all the good stuff is already there! I already had a 429 just begging me to give it a new home! Like a 429, the 351M can easily be enlarged to 400 CID simply by buying the crankshaft and pistons for a 400 instead of a 351M, which are all parts I would have to replace anyway. The 351M/400 engines are considerably lighter than the 429/460s, especially when the M engines are equipped with aluminum manifolds, water pumps, and gear-reduction starters. Less weight means a better handling vehicle on the road and a vehicle that has better off-road manners as well. In stock form, the 351M/400 is 145 lbs. lighter than the 429/460. Most performance parts from the 351 Cleveland will work on 351M/400 engines, therefore performance parts are readily available. The 400's stroke is longer than that of both the 429 and the 460 (4.0" for the 400 VS. 3.59" for the 429 and 3.85" for the 460) which means more torque at lower RPM, which is exactly where you need it in a heavy Bronco. The 400 develops it's peak torque at a lower RPM than even a 460, which will be a big advantage if you plan on using your Bronco for heavy towing. Although a 429/460 can be installed in a Bronco using all factory parts, you will have to do a lot of searching in salvage yards to find the parts to do it right. 429/460s are getting hard-to-find and the parts required to make it fit using factory Ford parts getting scarce as well. There is a full engine swap kit available from L&L to install a 429/460 in the Bronco, however, this kit cost around $1,000.00. This kind of money will go a LONG way toward rebuilding the original 351M/400 engines. 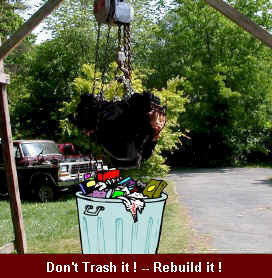 No need to hunt for parts in salvage yards or to buy expensive installation kits -- everything you need is already there! No need to modify your Bronco's exhaust system. Emissions legal if all factory emissions equipment is reinstalled and in proper working order. If you live in an area where your vehicle is required to pass visual and tail pipe emissions testing, you will not be able to install a 429/460 in your Bronco anyway. The only exception would be installing a 78 or newer 460 in a 78 Bronco. Since the 78 Bronco was considered a heavy-duty vehicle before the EPA raised the HD rating to 8,500 lbs in 1979, it would technically be legal to perform this swap, even in California. However, if you own a 79 or newer Bronco, you can forget about legally installing ANY 429/460 in your truck. The 351M/400 can be made to out perform most stock 429/460 engines with a small investment in a new manifold, 4V carb, and a quality camshaft kit, which are all parts that should be replaced during a quality engine rebuild anyway. In fact, all of these parts can be purchased for only a little more than the average price of a used 460. I still have the 429 should the 351M rebuild not satisfy my requirements. "How to Build a 351M/400"
"Installing a 429/460 -- The Right Way!" ** Higher Resale Value -- Yes, no matter what anyone tells you, replacing your original engine with anything else, even a 460, will lower your truck's resale value. To be fair, some Bronco enthusiast would actually pay more for a Bronco that has a 460 installed in it, however, most people look favorably at a vehicle that still has it's original engine. Consider an average buyers point of view; they have no idea what you did and where you got the parts for the swap. Also imagine trying to find replacement parts for a vehicle with a different engine in it! There are also legal issues the new buyer will have to deal with if they live in or are planning to move to an area where vehicles have to pass emissions testing before they can be registered. Just imagine the nightmare the new owner would have to go through if he or she went to have the vehicle tested and they found out the truck can not be driven until a "legal" engine is installed in the truck.